"I truly believe the Monte Vista Community and Monte Vista School District are the best places around. I will always stand behind Monte Vista High School. We have the best kids and parents around. I will defend that until the day I die!!" Mr.Wiedeman graduated from Monte Vista High School in 1987. He received his BA in K-12 Physical Education. From 1991-1996 he became a teacher and coach at Sanford School District, he taught K-12 PE and Middle School Science. 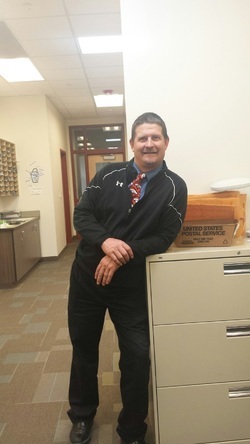 Mr.Wiedeman was also the Head Football and Wrestling Coach at Sanford High School in 1996. He then moved to Battle Mountain High School and became the Athletic Director and Head Football Coach. In 2001-2002 he became the Defensive Coordinator for football at New Mexico Highland's University. During 2002 Mr.Wiedeman moved back to Monte Vista and became a teacher and a coach of the baseball team. In 2006 he became the Athletic Director for Monte Vista High School, while still coaching the baseball team before retiring from coaching in 2010. Fall of 2010 Mr.Wiedeman became the Principal for Monte Vista High School.